Mount Koussi Anglo-Egyptian Sudan-French Equatorial Africa-Libya. 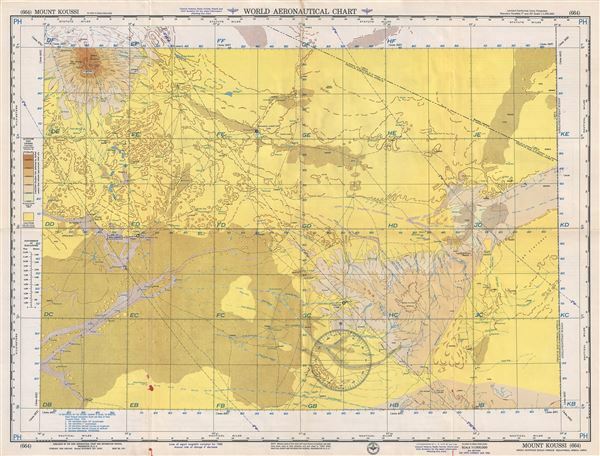 This is a scarce 1955 U.S. Air Force aeronautical chart or map of Mount Koussi or Emi Koussi in the central Sahara in northern Chad. It covers from the high pyroclastic shield volcano of Emi Koussi, the highest mountain in the Sahara, southward to Koro Toro and east to include the southernmost part of Libya. The cities of Faya – Largeau, the largest city in northern Chad, Ounianga Kebir and Fada are noted. The map is highly detailed, noting communes, valleys, mountains, deserts, rivers, dunes, cities, towns, and other hydrographical and topographical features essential for the air pilot. Verso of this chart features legends and a world aeronautical chart index. This chart was published by the USAF Aeronautical Chart and Information Service, Washington 25, D.C., and was issued as chart no. 664. First issued in 1948, this is the third edition revised to May 1955.